A recent news article published by Buzzfeed revealed the involvement of American mercenaries contracted by the United Arab Emirates (UAE) in a 2015 assassination attempt on Anssaf Ali Mayo, a local Islamist party leader in Yemen’s southern port city of Aden (Buzzfeed, 16 October 2018). While the national identity of the perpetrators came as a surprise to many, their actions fit within a worrying trend that has left at least 32 religious and civil leaders dead in Yemen’s south since 2016. Shortly after the takeover of Sana’a by Houthi militiamen in the early months of 2015, the internationally recognized president Abdu Rabbu Mansour Hadi fled to the south and established Aden as the temporary capital of the country, as well as a base from which the military efforts against the Houthis would be fought. The UAE became involved in Yemen’s civil war shortly after as part of the Saudi-led coalition, which backed Hadi’s efforts to dislodge the Houthis from the country. In doing so, they were placed in an informal and uneasy alliance with the Al-Islah party, an Islamist party advocating for unity of the country and supporting the internationally recognized government in the form of fighters, money, and political support (Al-Islah news, 26 August 2018). Assassinations of clerics and Al-Islah officials began directly after the Saudi-led coalition became involved in the fight against the Houthis. Cracks in the southern-based coalition against the Houthis began to show as advances northward stalled. Perceived incompetence of the Hadi government to provide adequate security and restore order in areas under their control encouraged the UAE to fund and train local counter-terrorism forces, including the “Security Belt” (ACLED, March 2018). Violence escalated in Aden during the first months of 2018 when pro-separatist elements of the Security Belt participated in the “Battle of Aden”, temporarily taking control of key institutions from the internationally-recognized government (ACLED, February 2018). At the same time, the number of assassinations targeting local Imams and Al-Islah-linked clerics in the city began to rise (see Figure 1). 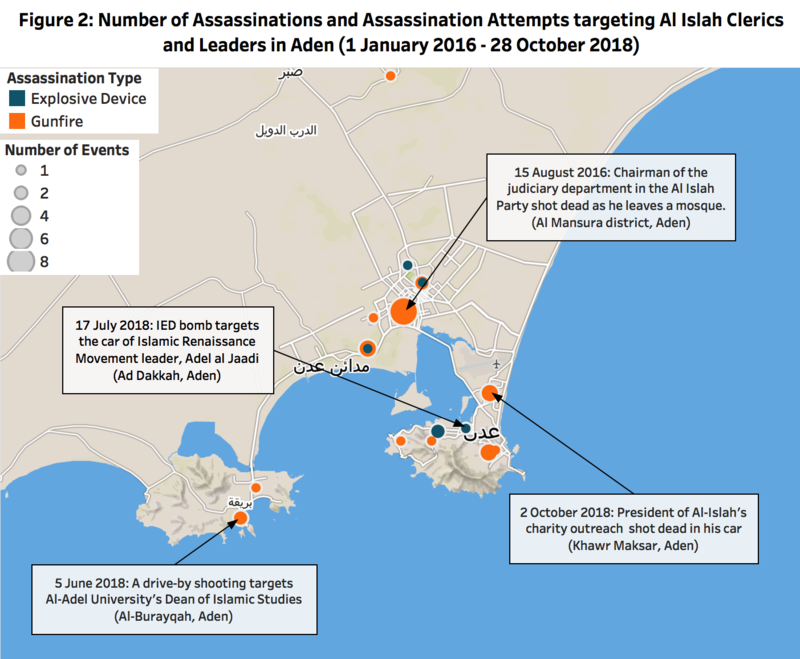 By monitoring local and international sources, since 1 January 2016, ACLED has identified a total of 53 assassinations or assassination attempts targeting clerics and Al-Islah party leaders in the provinces of Aden, Lahij, and Ad Dali, resulting in a recorded 32 fatalities. Over half (28 attempts accounting for 16 of the fatalities) have occurred since 1 January 2018. The troubling trend of murders continues – on 24 October 2018, unidentified gunmen riding a motorcycle killed the Imam of the Tawka mosque in Aden’s Khor Maksar area (Yemen Shabaab, 25 October 2018). Earlier this month, journalist and acting head of Al-Islah in Ad-Dali governorate Zaki Al-Saqlidi was shot dead by armed men as he sat in his car (CPJ, October 2018). On 2 October 2018, the president of Al-Islah’s charitable outreach was kidnapped in Aden. His tortured body was found some hours later along the coast of Khor Maksar (Aden Al-Ghad, October 2018). While Buzzfeed only linked the UAE to one of these assassination attempts, many suspect that the carefully conducted attacks fit within a wider trend of UAE-led efforts to expand their influence in the region and repress political Islamic organizations like quietist Salafi organizations and Al-Islah, which they accuse of being linked to Al Qaeda (POMED, January 2018); (ACLED, October 2018). The assassinations are largely carried out by unidentified gunmen who conduct the killings from motorcycles or moving cars. Often, the victims of these attacks are shot dead as they exit mosques or Al-Islah political buildings, and the perpetrators are rarely, if ever, caught. There have also been a number of bomb attacks, where an improvised explosive device is attached to the car of the targeted official or clerical leader. These assassinations are only a small part of the multiple conflicts being fought in Yemen and make up a tiny fraction of the total fatalities. Yet, they could have a huge impact on future efforts to bring stability back to the country. Al-Islah was seen as the “kingmaker” of the Yemen Arab Spring and remains highly influential within the country today. The party supports president Hadi, favors unity, and wants to largely appear as the “ones who played by the new institutional rules and abided by the revolutionary project of a ‘civil state’” (POMED, January 2018). Yemeni activists have remarked that the assassinations were already having an impact on local communities. In a city with little order and a plethora of competing armed groups, the moderate Imams provided a voice of reason. “The clerics were effective leaders in their communities. They solved disputes and gave advice. They were their communities’ teachers and spokesmen” (Washington Post, August 2018). By examining the individual cases of each assassination, it is clear that the targets are not chosen at random. Those attacked are often high-ranking influential leaders within the community, and their death not only narrows the political space but erases intellectual and religious infrastructure that could be vital to rebuilding Yemeni society. While Al-Islah is involved militarily throughout the country (most notably in Taiz), it is clear that Aden is where the impact of these killings will be felt the most. Targets in the city have included influential university professors, Salafi and Al-Islah party leaders, judiciary officials, and social welfare directors (see Figure 2). Meanwhile, UAE-backed security sources in the city of Aden accuse the Al-Islah party itself of conducting the assassinations. According to a Washington Post interview with a UAE-backed security commander “[Al-Islah] is killing the moderate clerics to replace them with those who are more extreme” (Washington Post, August 2018). In reaction to the Buzzfeed article detailing the identity of the attackers in the 2015 attempt, Al-Islah representatives have accused the UAE of making the annihilation of the Al-Islah party the first aim of its presence in Yemen (Middle East Eye, 17 October 2018). 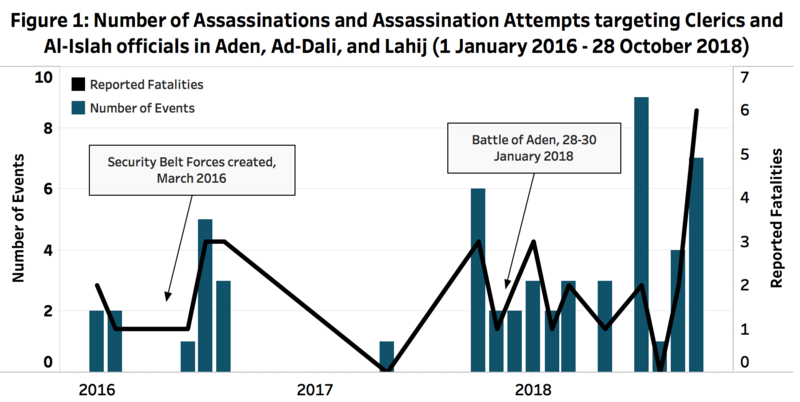 While it remains unclear exactly how the assassinations will affect Al-Islah’s future political engagement in the country, data collected weekly by ACLED suggest that incidents are continually on the rise and may escalate further. The killings illustrate intense factional divisions present in many parts of the country, and highlight the serious security issues that persist even in areas far from the frontlines of the war against the Houthis. Given Al-Islah’s political influence within the country, these actions could threaten future options for stability in the region and pose a lasting challenge to peace. Find an explanation of ACLED’s methodology for monitoring the conflict in Yemen here. Braden Fuller is a Middle East Research Assistant Manager with ACLED. In his role, he oversees and completes the coding of political violence and protest events in Yemen and Saudi Arabia. He is a student at Brigham Young University where he is completing a degree in Middle Eastern Studies and Arabic. Braden is fluent in English, Arabic, and Amharic and is based in Cairo, Egypt.